Hari Raya just passed. Deepavali has just gone and year end is approaching. Hari Raya Qurban, X'mas, New Year and Chinese New Year all around the corner. Every year when come to Hari Raya time or even Puasa month, I just feel like "Oh, I'm done for the year. It's holiday time!!" Holiday time means travel time. Yoohoo! But wait a minute, I gotta prepare 'cause this year travel isn't the same like previous, how do I make sure my lovely Wind stay with me lively all the times? You'd know, my Wind was the very first batch of Wind bundled only with a 3-cell 2200mAh (unknown WHr) battery, generally last for +/- 2 hours only. How do I make sure it can last longer throughout the journey? Since I travel in car most of the time for now, I have been looking for car DC power adapter since long ago, not only for my Wind but also my other gadgets. Getting a higher capacity battery is definitely the alternative, but that is my future upgrade when the 3-cell shows sign of degradation or when I need to travel oversea again. I checked with the local MSI distributors as well as the Taiwan HQ, MSI does not produce such accessories. So the only way is to look for third party accessories. Shopping through the IT Malls, there are plenty of such products, but most products are DC to AC Power Inverter like the one on the left (click on the image brings you to the vendor site). 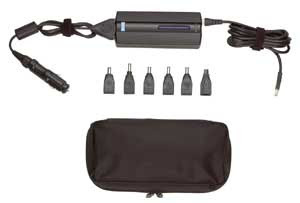 You will need to plug in the lappy power adapter to the inverter to charge your lappy or other gadgets in the car. I am skeptical with such inverter, it provides higher power rating to allow you to charge multiple devices or high power device (as long as the total power required does not exceed the rating on the inverter), but this also means it draws more power from the car power source, it may impact your car battery lifespan. Moreover, I just think it's inefficient in the cycle to convert car 12V DC to AC power and then again back to DC power by the power adapter. Since it's a transformer to manage high AC power, it comes with a fan. I believe it generates heat as well as noise in the car, making your car like a power generator room than a cool ride for a pleasant journey. Don't worry about higher amp, the voltage is the key to determine if your toy get fried. Read this thread or here if you need more comfort. With this adapter, now I can use my Wind as GPS for long journey (when I am not driving my cool FD), and also to start tracking new roads for contribution to MSM.